CRANBURY, N.J. — A recent publication from The American Journal of Managed Care (AJMC), the leading peer-reviewed journal dedicated to issues in managed care, addresses the role of community pharmacies in boosting adult vaccination rates in the United States. 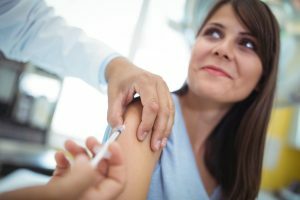 According to the Centers for Disease Control and Prevention, adult vaccination rates remain low for a variety of vaccines, including influenza, pneumococcal, and herpes zoster. As educated and accessible healthcare providers, community pharmacists are poised to increase immunization rates through outreach efforts and convenient administration of vaccines. In this publication, available alongside the July issue of AJMC, challenges and opportunities in immunization practices and highlights barriers to optimal community-based vaccination are examined. In addition, potential paths for optimizing reimbursement for immunization-related services through benefits design are explored. Despite various challenges related to access and awareness, pharmacists will continue to make a positive impact on the immunization spectrum. “Pharmacist-led immunization has increased vaccination rates across the country and allowed physicians to spend more time with their patients during office visits”, pharmacist Jennifer Gershman said. Offering education, advice, and guidance, in addition to providing a venue for and the administration of vaccinations, community pharmacists are in a highly beneficial position when it comes to helping public health efforts aimed to closing the vaccination gap. In concert with these efforts, healthcare professionals within the managed care community can identify additional opportunities—particularly in the spectrum of benefits design—to improve the infrastructure of vaccine delivery in the United States. The post AJMC spotlights the role of pharmacists in boosting vaccination rates appeared first on CDR – Chain Drug Review.